As a dedicated fleet and commercial vehicle dealer, Atlanta Commercial Trucks strives to give the very best in service and deals for the workforce of Atlanta, Marietta and more. That’s why Atlanta Commercial Trucks is discounting all of our 2015 RAM ProMaster and ProMaster Cities up to $5,000 off! If your Atlanta fleet vehicles have needed an upgrade, there’s no better place than here and no better time than now! Our 2015 RAM work vans are new, ready to be test driven and ready to work for your business. Whether you’re a fan of the best-in-class payload of 4,440 pounds or standard award-winning Pentastar V6, your Atlanta business can’t go wrong with a 2015 RAM ProMaster. These cargo or passenger vans are available in high or low roof. Versatility is the name of the game as other available features include the five-inch UConnect Touch Screen and 3.0-liter EcoDiesel engine. Know you and your cargo or passengers are riding safely with the 16-inch Brembo brakes and the available, unsurpassed five-year, 100,000-mile warranty. Great for construction sites, catering businesses, law enforcement and more, the 2015 RAM ProMaster is a must-have in the tool belt for Atlanta businesses. RAM added a new vehicle to its fleet line-up for 2015, and it has not disappointed. 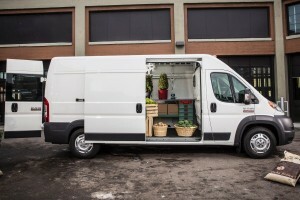 The peppy RAM ProMaster City is the choice work vehicle for urban areas. Electricians who work downtown, floral shops delivering to high-rise buildings, taxi services – the possibilities go on and on with the 2015 RAM ProMaster City. The cargo capacity is best-in-class with 131.7 cubic feet, and the 60-40 rear doors make loading and unloading much easier. The ProMaster City vans have best-in-class 178 horsepower and 174 lb.-ft. or torque. An efficient and powerful 2.4-liter Tigershark multiair 2 engine powers the vans and is mated with a class-exclusive nine-speed automatic transmission. Packed with best-in-class and class-exclusive features, the RAM ProMaster City gets up to 21 mpg city and 29 mpg highway. These discounts mean we’re ready to help serve the Atlanta workforce! Powered by Landmark Dodge Chrysler Jeep RAM, Atlanta Commercial Trucks has the backing and expertise of Georgia’s No. 1 RAM dealer, so you know you’re getting the best deals on “The Georgia Giant” can offer. Contact Atlanta Commercial Trucks today!